Melissa, from ‘The Book Binder’s Daughter’ wrote about her personal canon, her list of alltime favourite books, recently. I saw Aeschylus‘ ‘Agamemnon‘ on the list and I was excited. ‘Agamemnon‘ is the first part of the tragedy ‘The Oresteia‘. 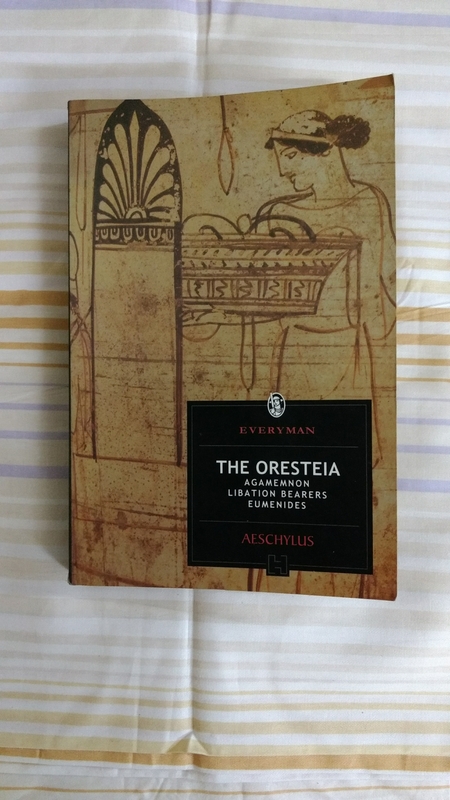 I have wanted to read ‘The Oresteia‘ for a long time, and though I knew the story through other sources, I wanted to experience it through the original. But a copy of the book was hard to get. I was excited when I was finally able to get the book, but then I put it in my shelf to be read later. I decided that, that ‘later’ has arrived and it was now and took it down and read it. I must be the last person to read ‘The Oresteia‘, but if you haven’t, here is the story. It is filled with spoilers – I am not leaving anything out – and so please be forewarned. ‘The Oresteia‘ has three parts – Agamemnon, Libation Bearers and Eumenides. In the first part, Agamemnon who is Menelaus’ brother, returns home after the Trojan war. His wife Klytaimestra (or Clytemnestra as her name is popularly spelt) receives him warmly, but behind his back gets together with one of his enemies and plots to kill him. Her reason for doing that is that Agamemnon sacrificed their daughter Iphigenia at the start of the Trojan war, because the priests told him to. (Clearly George RR Martin borrowed that in ‘Game of Thrones‘!) Klytaimestra could never forgive him for that. Klytaimestra does her dark deed and Agamemnon is dead at the end of part one. In part two, ‘Libation Bearers‘, Orestes the exiled son of Agamemnon, returns home in disguise to visit his father’s grave. There he bumps into his sister Elektra, who has come there to perform a formal ceremony, pouring libations on her father’s grave. Brother and sister get together and plot against their mother and decide to punish her and avenge their father’s murder. Orestes gets into Agamemnon’s home in disguise as a messenger, is able to get his mother Klytaimestra and her new partner together and kills them both. The second part ends here. In the third part, ‘Eumenides‘, the Furies, which are dark, really bad creatures which live in dark places, are chasing Orestes. The Furies have a special place in the world of that time – they chase murderers who have killed someone of their own blood and torment them and kill them and continue tormenting them in the after-life. No human, whether king or pauper, who has committed this grievous act is safe from them. Orestes flees from them and asks for help from the god Apollo. Apollo asks him to go to the temple of Athena and pray to her. The Furies chase him down there. Athena arrives too. She hears both sides. Orestes says that he killed his mother because she killed his father. The Furies say that anyone who kills his mother should face the consequences as meted out by the Furies, which was the ancient law. Athena constitutes a court of wise people from Athens, asks both sides to present their case, and asks the jury to vote. They get a hung verdict. Athena has the casting vote and she decides in favour of Orestes. The Furies are enraged. They swear to destroy the city of Athens. But Athena mollifies them, provides them a place of residence there, and elevates them to the status of gods. Everyone lives happily everafter. Except for Agamemnon and Klytaimestra, of course. Because they are dead. In a revenge story, we all take sides, and traditionally, Klytaimestra has been regarded as the bad person, atleast from what I know. But when I read the play, it was hard for me to not like her. She was avenging her daughter’s unnecessary death and we could feel the deep pain of her heart, the heart of a mother in mourning. And because of that I was cheering for the Furies in the end. I have never liked the Furies before, and I have always found them scary, but when I read this, I could see their point of view. I loved most of ‘Eumenides‘ because the Furies have a huge part to play in that and they speak some powerful lines. The end of the play is interesting, because it has always been regarded as the dawn of a new world, with the old giving way to the new, and custom and tradition giving way to the rule of law. But the translator, Michael Ewans puts paid to all such thoughts when he quotes another scholar in his introduction – “the cliché we have heard repeated all our lives, that the Eumenides depicts the transition from the vendetta to the rule of law, is utterly misleading…This trilogy is not an allegory of the evolution of civilization, or of divinity.” That is depressing. But I am a firm believer in Mark Twain’s advice – “Never let the truth get in the way of a good story.” So, I am going to ignore Ewans’ advice and stick to the popular interpretation, that the end of the Eumenides signifies the dawn of a new era. I don’t know how Michael Ewans’ translation compares with the others – especially Richmond Lattimore’s and Robert Fagles’ – because I haven’t read the others and I don’t know Ancient Greek, but as a general reader, I liked it. Ewans, in his introduction, talks about how plays were staged in Ancient Greece, how Greek theatre is different from today’s theatre and on the challenges of translating Aeschylus into English. He is an academic in classics who has spent many decades teaching and staging ‘The Oresteia‘ (he says it all started with his doing his PhD in it) and so he must know one or two things about it. I will take that. The edition I read also had notes in the end stretching to more than one hundred pages – nearly half of the book – and it had detailed commentary on the scenes and on how they were probably staged originally and how performers can stage them today. A very useful resource for theatre artists. I discovered that there are two other plays which cover the same story, but probably from a different perspective. Both of them are called ‘Electra‘. One is by Sophocles and the other is by Euripides. I can’t wait to read them and compare them with ‘The Oresteia‘. Have you read Aeschylus‘ ‘The Oresteia‘? What do you think about it?